Today I was picked up at 6.20 in the morning, at the residence of Max and Marilyn. For Marilyn it's no problem to wake up early, she's always awake at six, she said. I thanked her for letting me stay at their place and stepped into this big Toyota Landcruiser of Fraser Island Excursions. Indeed, today I was going to see Fraser Island. Known as the biggest sand island in the world and many people emailed me to say it must be one of the most beautiful places in Australia. 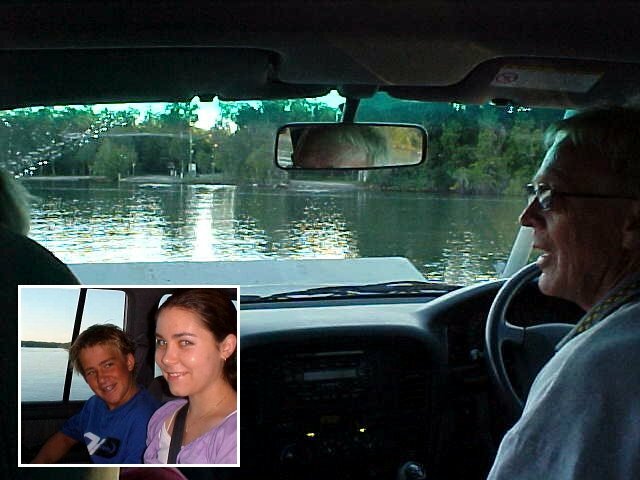 With Peter O'Brien as the driver and the Angus family from Adelaide as my fellow passengers we headed up north. Using the Noosa beach as the highway, we drove some 80km up north, which is strange, because I have never been in a car that drives 100 km/hr on a beach. From the long-stretched Noosa beach, we drove along de Cherry Venture shipwreck and Rainbow Beach, called like this because of its coloured dunes. The aboriginals believed something happened that made the rainbow fall down in the sand. And there we were, looking over at Fraser Island at the other side of the bay. We had coffee and freshly baked cookies on the beach, just for a break, before we got onto the barge towards the phenomenal Fraser Island. 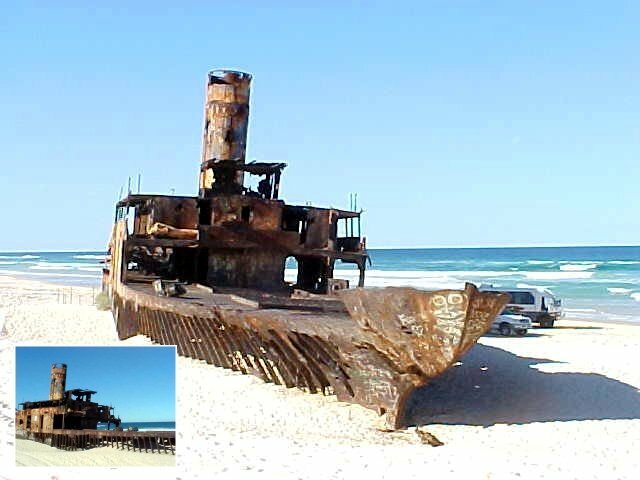 Fraser Island is indeed the largest sand island in the world and it's listed on the World Heritage List. It's 124 km long. Sand? 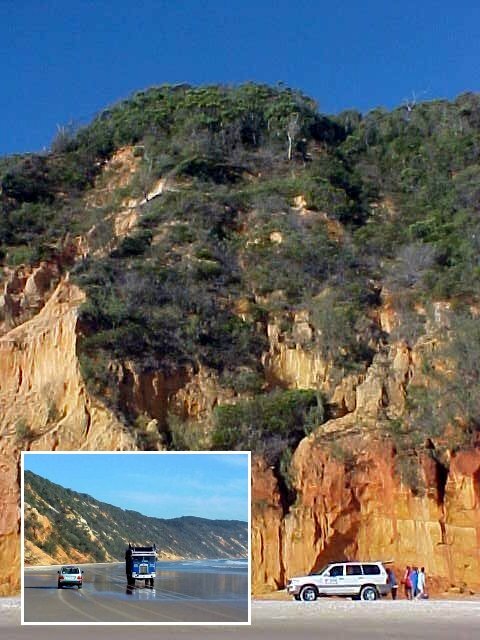 Over a periode of 80,000 years the island's sand has come from the tablelands of northern New South Wales, washed into the sea by rivers and carried north by strong see currents. After some volcanic happenings in the water, three rocks were created. The sand curled itself around it and created Stradbroke Island (later broken in pieces after a cyclone) , Moreton Island and Fraser Island. Just pure pure washed up sand. 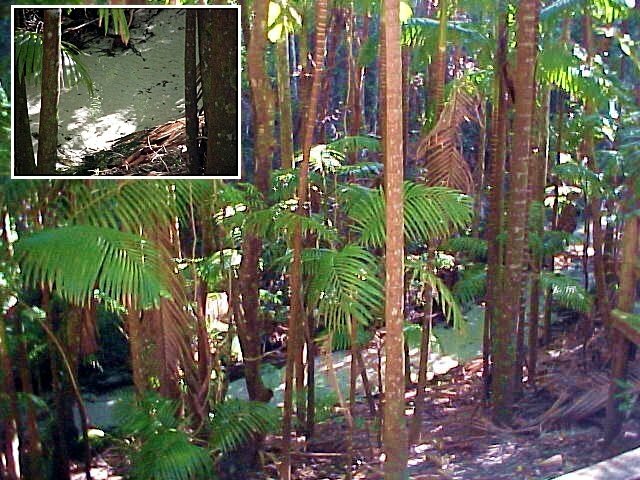 And where is sand and water, the is vegetation, but on Fraser Island only the top 20 cm is fertile, the rest is, indeed all sand. On Fraser Island we drove along the Seventy Five Mile Beach (high speeding again of course), which is also known as the world's longest and widest landing strip. Well, the few planes of Fraser Airlines can land anywhere here. We got inland at a place called Eurong, better known as Eurong Village or Eurong Beach Resort. Out of nothing appear a big reception building, a big dining room and holiday units and a few three-storey high flats ruin the scene. How. Can. You. Do. This? I asked Peter, the driver if Eurong was short for You Are Wrong, but it seems to mean 'place of camps' in the aboriginal language. Okay. But we drove on towards Central Station, in the southern centre of the island and in the middle of the island's rain forest. We walked on a path along the Wanggoolba creek, where the purest water in the world runs towards the ocean. 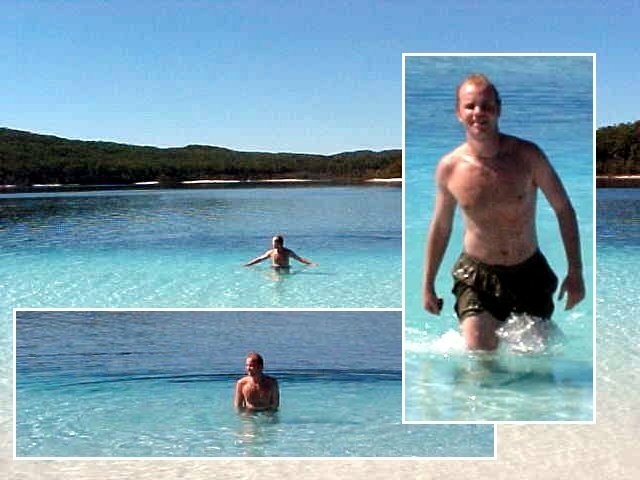 Peter told me that Fraser Island also contains an enormous amount of fresh water. Untouched, pure natural fresh water, I mean. And every day, hold on to this, 50 million liters of fresh water gushes off the island. And the Wanggoolba Creek is so pure, the bottom is just sand. From Central Station it was only 20 kilometres up north to Lake McKenzie (huh? ), one of the many natural freshwater lakes on the island. Here we had a long stop, as Peter was going to prepare our lunch here and we all could go for a swim! And that was an experience. The eight metres deep clear water. White sand. Speechless. Beautiful. Exhilarating! Just look at the photos and even photos can't really describe how this place feels like. One hour of swimming, sunbathing and exploring around, Peter had set up a table at a picnic area. Our lunch contained Tandoori Chicken Breast, served with salad and crusty bread, Australian cheeses with crackers and a tropical fruit salad. This time the world traveller is being spoiled by the Sheraton Noosa Resort, which caters the tours from the Fraser Island Excursions company. Irene, who works at this small family business, offered me this trip. She heard me last week on MixFM radio, when I was in Buderim. "I just thought I had to be to first to get you to Fraser Island, it's beautiful!" she said. Their company has a fleet of three air-conditioned land cruisers and they cater only small groups of six, to keep this trip a real personal experience. And it was, maybe also because of the enthusiasm storytelling by driver Peter, who is directly talking to the others, and me, instead of into a microphone for a full bus. 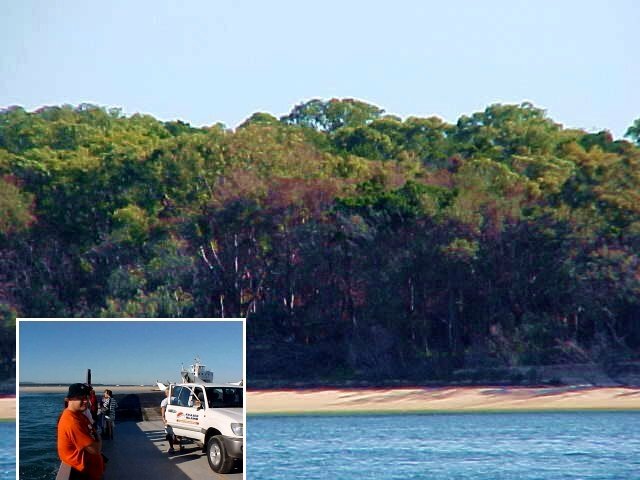 It was already becoming three o'clock and as Fraser Island is an island, we have to get off the island before the tide gets to low for the barges to sail. There we went again, through the unspoilt wilderness, surrounded by 30metre high trees, lush rain forests and on sandy roads, back to civilisation again. It might sound like a short trip, but it was an adventure for me. Okay! Okay! Everybody in the emails was right; it is indeed a beautiful place! Around 4.30pm we arrived back in Noosa again, where Peter dropped me off at the office of the tour company and I met up with Irene and here husband. They were very excited about my project, so I was interrogated for some 30 minutes and made them smile with some interesting travel stories. Irene noticed that I was tired and she personally drove me to my next sleeping address: the Halse Lodge. Exactly where I had stayed last Wednesday too, on invitation of Drew Pearson. When I last stayed there, I had to go south again for the zoo-experience, so the staff at the reception booked me in for another night at the lodge, so I can draw back and relax when necessary. Actually, they booked me in for two nights, so tomorrow I'd stay here too. They would help me out with meals and some drinks (not as much as I had the last time when the next day became Hangover Day for me) and I could do whatever I wanted to do on my own. Great. The first thing I did was settling my stuff in my dorm room and I had a good afternoon nap. Around 7pm in I went downstairs in this spacious lodge and bumped up to the Brit girls Frenchy and Laura again. They read my report about my last visit and Frenchy thought I wrote pretty negative about them 'alcoholics', while Laura was having pains of laughing as she read about them on the Internet. Tonight they were on water, by the way. Barman Steff handed me a coke, Sue came up with a plate of Thai Chicken with rice and I was happy. Not that people have to pamper me to make me happy, but this whole day, these last four days, have been so unexpectedly odd. But I miss Irena. Last Friday she finished her military training of three months and today she is starting her job as a skilled trauma consultant commander, stationed in the north of The Netherlands. She'll soon find out if and how long she can get on leave, as she already told me that she wants to visit me. Definitely.